Dodging the Shropshire showers we admired the stunning scenery along part of the Offa's Dyke long distance footpath from Knighton, on the border with Wales. 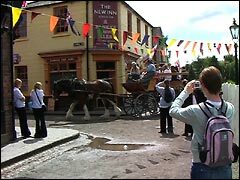 Then at Ironbridge Gorge we stepped back in time, saw the famous Iron Bridge itself and enjoyed a wander round the wonderful open air museum at Blists Hill Victorian Town. 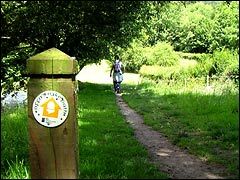 The weather looked good so we thought we'd start our Shropshire holiday with a walk along part of Offa's Dyke path. This shot's outside the excellent and helpful visitor centre at Knighton. 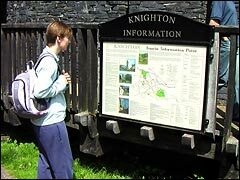 Knighton is on the Shropshire / Welsh border and soon after starting along the Offa's Dyke path we came across this sign to remind us. As you can see the scenery is, well, wonderful! 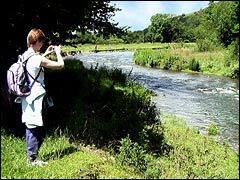 ...the gorgeous view by the River Teme. The river was pretty fast flowing after the heavy rains of recent weeks. 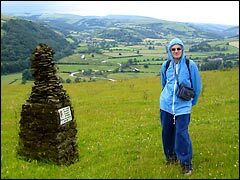 Links to Offa's Dyke in our tourist resources. Uh-oh - unfortunately the weather turned pretty nasty, but we made it to the top of Panpunton Hill as far as this 'dry stone' [ha! not today!] monument before turning back to Knighton. 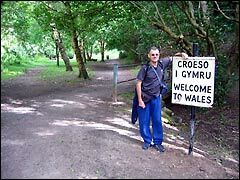 We must have walked, oh, all of 4 miles of the 177 mile Offa's Dyke trail! Next day we visited historic Ironbridge, birthplace of the Industrial Revolution. 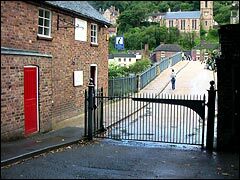 The old tollhouse on the left is now the visitor centre and museum containing the interesting Ironbridge history display. Belinda can be spotted walking over the Iron Bridge, hey, wait up! 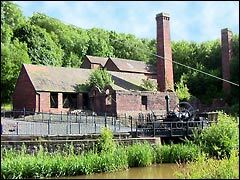 ...a few of the 10 wonderful museums at Ironbridge, including the Coalbrookdale Museum of Iron, we headed for Blists Hill Victorian Town. 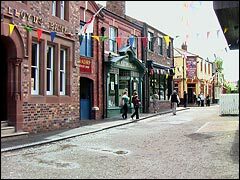 The High Street at Blists Hill has quaint shops presented just as they were in the early 1900s. We could feel we were back in Victorian England, right in the heyday of our industrial heritage. 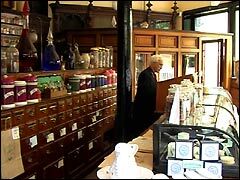 All the shop staff looked authentic in character costume, dressed as in Victorian times, seen here in the chemist's shop. 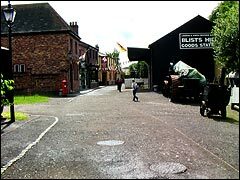 Other old-time Blists Hill shops included a butcher's, bank, printer's and sweet shop. 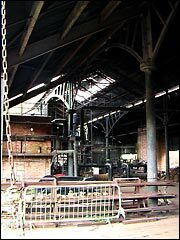 ...the Wrought Ironworks, just one example of Victorian industry at Blists Hill. After looking at the Victorian school and fairground (where Belinda won a coconut! 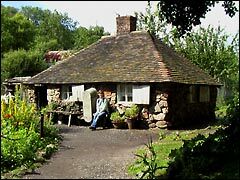 ), we came across this quaint Squatter cottage complete with a Victorian woman going about her Victorian chores. 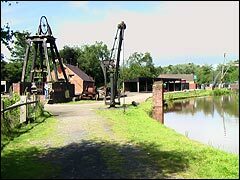 Beside the Shropshire Canal at Blists Hill is a canal-side mine, pit head steam winding engine and a half-model reconstruction of the Iron Bridge, just visible (yes, just) on the far right above. Many of the industrial sections at Blists Hill were there originally, including the brick and tile works seen here and also the old blast furnaces. Fascinating stuff, and an enlightening incite into our country's heritage. We thoroughly enjoyed our visit to Ironbridge and Blists Hill Victorian Town in Shropshire. The only bummer was the difficult to follow black and white scrappy piece of paper passing for the Blists Hill guide. Oh, and the school parties! The cost of the Ironbridge Gorge Museums passport, giving entrance to all 10 museums including Blists Hill, was a rather hefty £14, but it's possible to return at any time within the next year on this ticket. 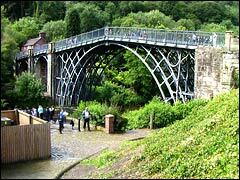 At least three days would be needed to visit all Ironbridge museums. We've also visited open air museums at Beamish in County Durham and Weald & Downland in Sussex.